Written by: Kenneth Seward Jr.
Handhelds and puzzle games go together like peanut butter and jelly. Almost every handheld ever released had a good puzzle title to accompany its line up. There is a certain freedom that comes with the ability to quickly jump into a puzzle game and play for a little while before moving on to something else. They are similar to mobile games in that regard, which is probably why they’re so popular with handhelds (or vice versa). Just like other handhelds, the 3DS has its share of good puzzle games. One of those is a new title from Zoe Mode called Crush 3D. 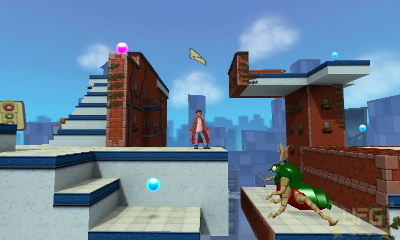 Crush 3D is a remake of the PSP exclusive Crush, released back in 2007. I haven’t had the pleasure of playing the original Crush, so I can’t say if there are any big differences between the two besides their visuals. What I can say is that this title is definitely worth picking up if you’re into puzzle games. Crush 3D follows the story of Danny, a young guy who volunteers to test his friend’s Cognitive Regression Utilizing pSychiatric Heuristics (C.R.U.S.H) machine. This invention allows Danny to explore his own mind; he is in a virtual reality world created from his own subconscious. Unfortunately, the machine thinks that Danny is suffering from some sort of mental problem and forces him to face his fears. He is trapped in his own mind and the only way out is to figure out what mental issue he is supposedly suffering from. In order to do this, he has to collect his marbles (get it) scattered around different worlds and levels within his mind. Good thing he has some help! Once Danny enters his mind, he is able to tap into a power that allows him to crush (flatten) the world around him into a 2D version of itself. By doing so, he can access areas, marbles, or other items he wouldn’t have normally been able to reach. For instance, let’s say there is a marble resting on a platform in the background of a level; parallel to the platform that Danny is on. In the 3D version of the world, there is a big gap between each platform. Since the platforms are parallel, if Danny crushes the world they’ll smash together to form one platform. This allows Danny to easily walk over and grab the marble. This is just one example of how this mechanism works. Puzzles require you to look around the level to see where you should crush (or uncrush) the world to reach your goals. The camera is controllable, so you can get a view of what’s above, to the right, and to the left of Danny. By crushing the world from these different views, you can get different effects. See an area you’d like to reach but it’s too high to jump to? Move the camera into the above view and crush to 2D. Now the ground you were standing on and the ground that was above you is on the same plain. All you would have to do is walk over to the area you wanted to get to and uncrush to 3D. Now you’re on the higher platform! In order to move to the next level, you have to collect at least half of the marbles placed in each level. Beyond just completing a level there are also collectible items scattered about that, once picked up, can unlock more game content. After playing a while, I realized that each level isn’t just one puzzle, but a group of puzzles depending on how “complete” you want the level to be. 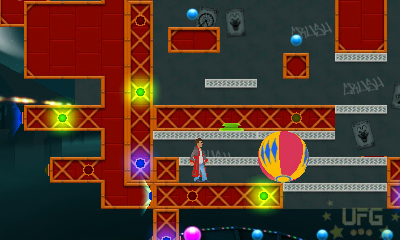 By collecting every marble in a level, you’ll unlock a new robe for Danny to wear. Picking up a book unlocks concept art that you can view in the gallery. There are even trophies placed in each level that unlock a new version of the levels you collected them from (more on that later). 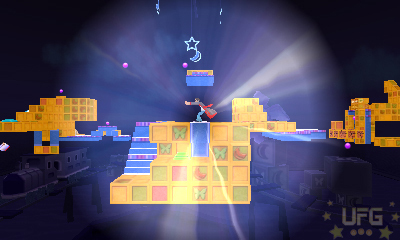 Solving each mini-puzzle while completing the overall level can be very challenging. With that said I never felt frustrated or so lost that I just couldn’t move on. Zoe Mode has done a great job designing puzzles that are brain teasers but not to the point that would require frequent trips to GameFAQs.com. Even if you did get stuck, there is an option in the menu for tips (located on the bottom screen) that will help you out. The crush ability alone would take this game pretty far. It’s a neat feature that is fun to play around with. However more intricate puzzles become available to the player as he or she slowly becomes familiar with the mechanics being introduced as they go on.. As mentioned before, collecting trophies can unlock new gaming experiences. In order to collect them you have to make them appear with the help of magic symbols painted on walls in each level. By crushing the world into 2D in such a way that the entire picture is shown, you’ll make the trophy spawn somewhere in the level. Not only that, you will have to be able to get to the place where the trophies spawn while keeping the world 2D as to not mess up the image. That can be difficult seen as how it’s easy to shut yourself out of an area because of physical barriers that only show up in 2D. There are other magic symbols that affects the world in different ways; one of them, when made whole by crushing to 2D, allows Danny to jump higher than normal. Then there are special platforms that work well in one dimension and not in another. You might not being able to see a skinny platform in 3D but by flipping the camera and going 2D, it could create a platform solid enough to stand on. These are a few of the elements that are introduced during play. There are buttons that control parts of the environment, giant bugs representing Danny’s fears to avoid, movable objects and more. The more you play, the more developed the puzzles get; a good thing as it keeps the game from becoming boring. Going backwards for a second, once you’ve completed a level and found its trophy, you’ll unlock the same level in Trophy mode. 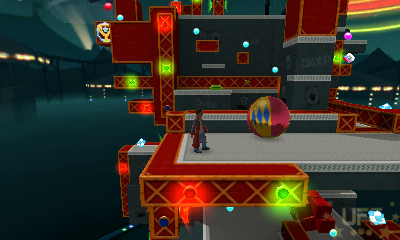 This is a harder mode than the main game as it put limits on how you can complete levels. You will have to complete each trophy level within a specified time limit. Not only that, it will also have a limit on how many times you can crush the world from 3D to 2D. You can see how this would make things difficult. I jumped into a level thinking it wouldn’t be that hard because I had just finished the main version. Surely I’d remember exactly how I beat it. Not the case. It didn’t matter that it was early on and didn’t feature some of the more involved puzzle elements. I still had to retry it a bunch of times before getting it just right, with only a few seconds on the clock to spare. If the game’s 40 + levels isn’t an indication of how long Crush’s lifespan can be, then trophy mode certainly is. 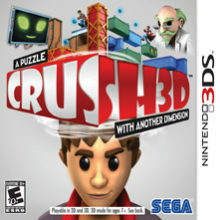 All and all, Crush 3D is a fun puzzler for the Nintendo 3DS. It has varied gameplay, cool mechanics, and over 40 levels spanning four worlds. Graphically, it isn’t hard on the eyes. I do wish the 3D aspect was more utilized though. As it stands, it only adds a minor visual upgrade; it doesn’t fully enhance the experience like some of the other 3DS titles. Not a big deal really. I can’t say the same when it comes to the music. While not entirely bad, the music did get annoying and I found myself playing on mute for a good portion of my play through. With that being my only complaint, there isn’t any reason why you shouldn’t pick up this title if you like puzzle games! This is a good puzzle title that gets better the more you play! The graphics are pretty good. I wish the 3D effect enhanced the title more though. The strange music got annoying after a while. While not completely new (this is a remake after all) there are enough new elements brought to this genre to warrant the score. Over 40 levels, trophy levels, unlockables…yea, there is a lot to do!